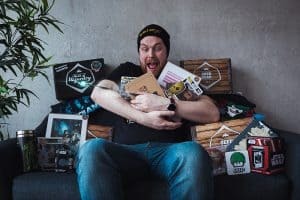 Last month I had a taster of the Geek Gear subscription box and it’s safe to say I am now a fan as I loved the ‘Dragon and Thrones’ box theme, so when the May box dropped onto my doorstep I was keen to see what was inside. May’s theme was ‘Battle’ and inside the ‘treasure chest’ designed Geek Gear box were seven Battle themed goodies to inspire the geek in you. All subscribers will get (5-10 products) £40 – £60 worth of geeky gamer style goodies in each monthly box for £19.99 and the Geek Gear team really pack the box full of high value items to enjoy. 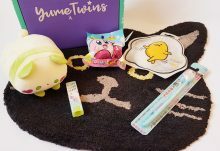 Each box will always contain a themed t-shirt as well, which is great value in my opinion as branded t-shirts are often more than the cost of the whole box. 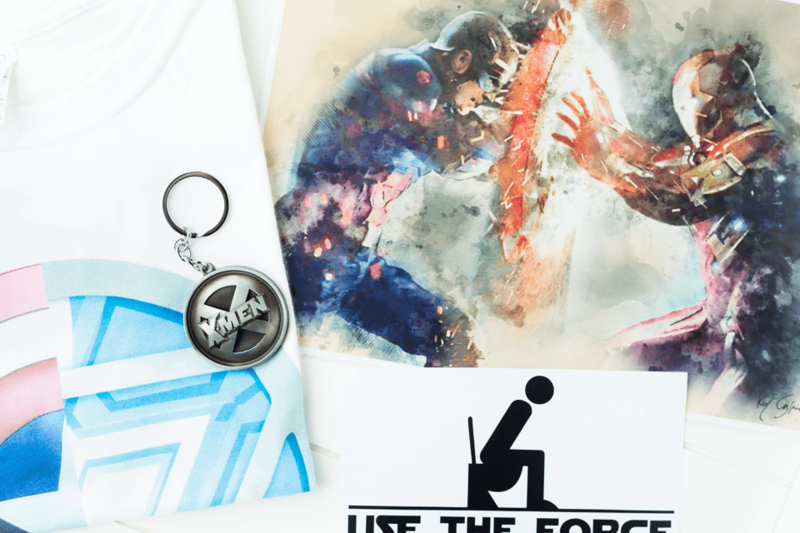 Geek Gear are confident that subscribers will love what they receive each month and once you are signed up you can cancel at any time so you don’t need to worry about being tied into any long term contract. Don’t forget to add in your preferred t-shirt size when you join as well as you will always get a monthly t-shirt included in the subscription. On to May’s Battle box and one difference in the box is that you either received a Limited Edition Chrome Darth Vader or a Funko Vinyl Bobble-Head. If you did have a Vinyl Bobble Head included it was a Finn, Rey or Kylo Ren from Star Wars. In my box was the Pop Vinyl Darth Vadar 01 which is a Limited Edition for Geek Gear and what a beauty he is! I have a bit of an obsession right now with my collection of Pop’s so this is a very welcome addition and the chrome version really stands out. If you take a look on the reverse of the box you can see the whole collection of Star Wars Funko Pop’s (01 to 07) and they are so cute (check out the Yoda!) and very collectable so I feel really happy to have a Chrome Darth Vadar in my collection already. 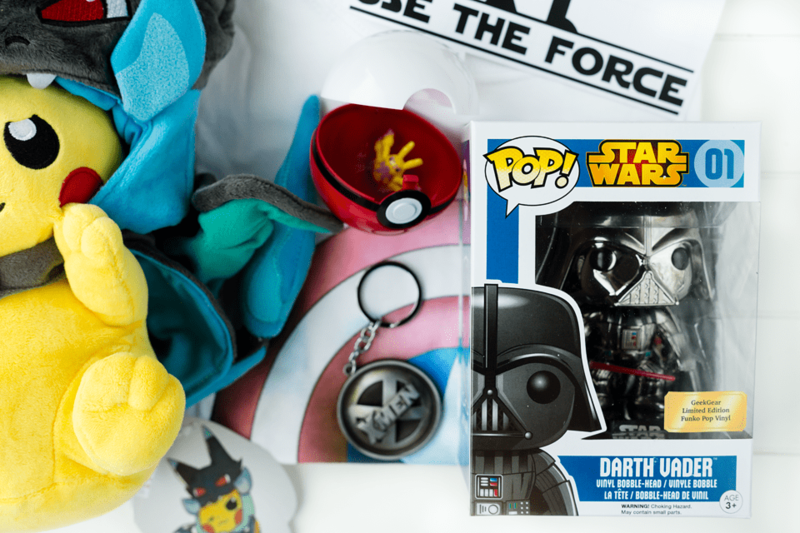 Also I must add that as the Chrome Darth Vadar retails for at least £12.99 not only can you add a limited edition Pop to your collection for only £7-ish more you get eight other items – which is such great value. 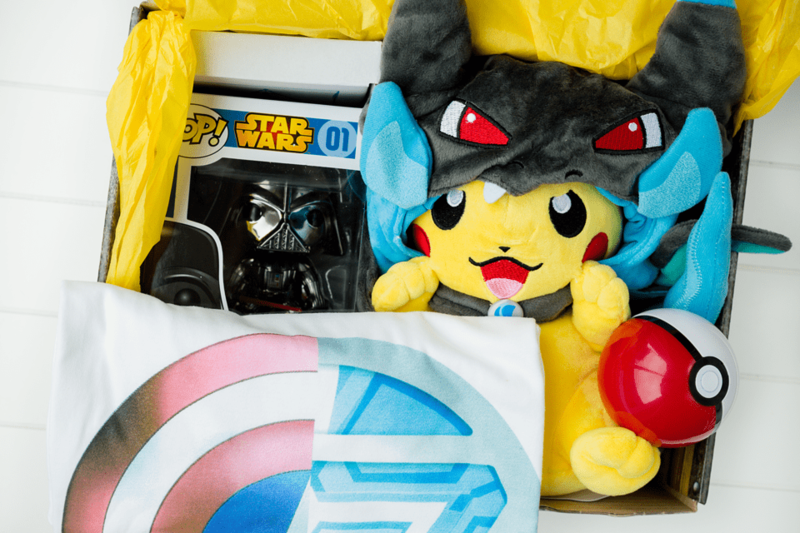 Next in the Battle box was from Pokemon and in every box was a mystery item, I received a plush and soft Pikachu as well as a PokeBall with one figurine inside. 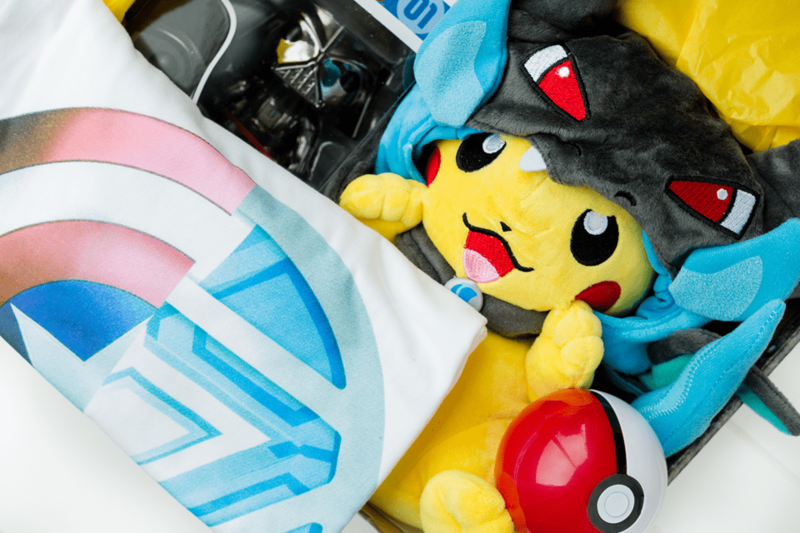 The soft Pikachu is a high quality plush with Charizard hat attached and is so cute and collectable and was packed so well into the box – I have no idea how they packed it in so well! The catch and return Pokeball is also highly collectable and comes with a little figure to add to your Pokemon collection. Each box contains a different pokemon mystery item though so you may have received a different duo. 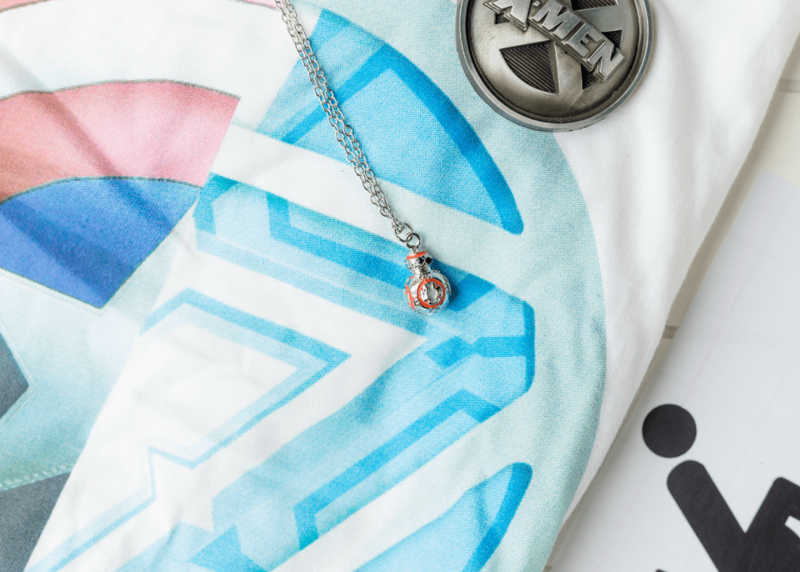 As in every Geek Gear box there was also a soft 100% cotton t-shirt with an exclusive Captain America Civil War design on the front and it’s such a wearable design too. I have written before how much I love the fact the Geek Gear folk include a t-shirt in every box and when it’s a great quality wearable one too it’s even better. Staying on the Captain America theme next out was a limited edition signed (by the author) print of Captain America – Civil War print which is exclusive to Geek gear and one of only 1000 made. It’s a colourful unique print that will look perfect framed and put on the wall. What I like about the Geek Gear box is the surprise element each month and what a treat to get either a Personalised Jedi Knight or Sith Lord Certificate in the May box. Yes that’s right, you can become a Jedi Knight or Sith Lord in the Battle box – so fantastic! 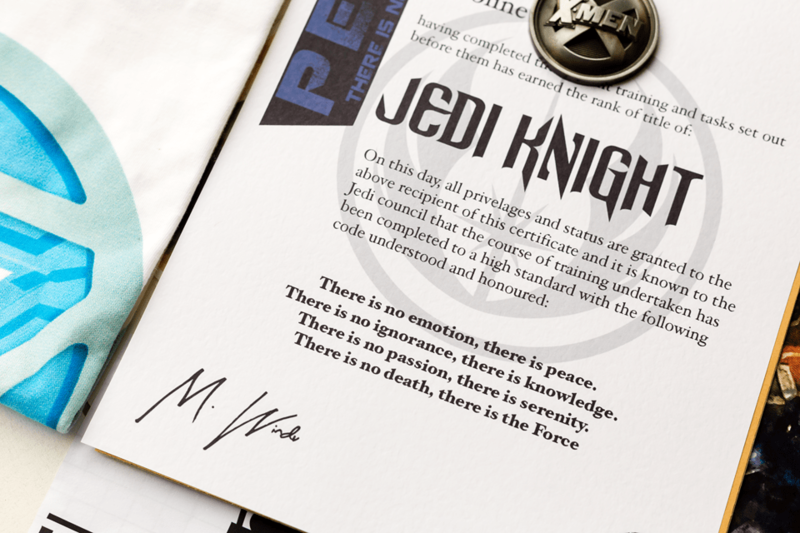 I received the Jedi Knight Certificate and it’s such a brilliant touch to personalise it too, very good quality paper and perfect Star Wars wording on the certificate. Geek Gear even ensured the certificate’s safe transit by placing it in a protective card sleeve as well. Also from Star Wars in the box was an exclusive BB-8 Necklace, a surprise inclusion as I wouldn’t expect any jewellery and the sweet little BB-8 droid on it’s silver chain looks lovely on. 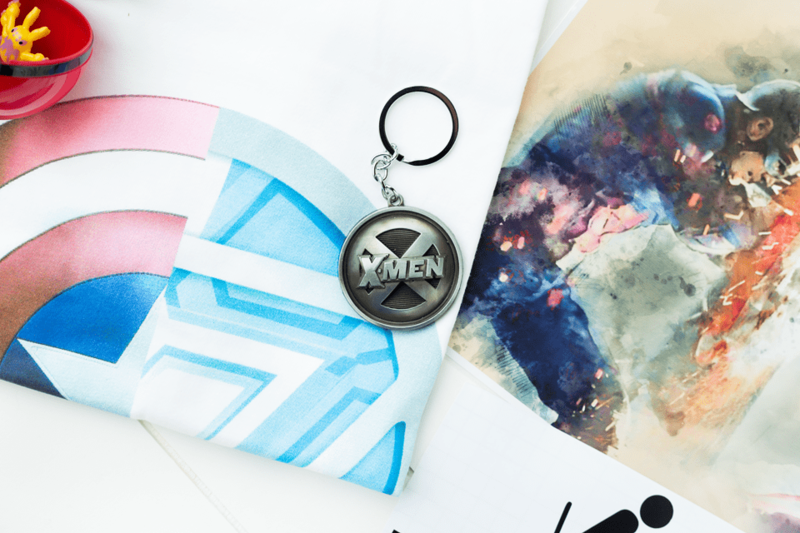 With the Battle theme in this month’s box I fully expected to see an item from Marvel and Geek Gear didn’t disappoint as the X-Men keyrings came in two different designs. I got the silver design but there was also a gold version in boxes as well, perfect for adding your keys onto or for bags or belts. Lastly a funny ‘Use the Force’ vinyl sticker for the bathroom door in a simple monochrome design and easy to peel stickers – a new look Star Wars style for the bathroom door! 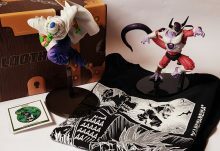 There’s nothing I didn’t like about the May Battle box and having dealt with the Geek Gear customer service team for a broken item I must say they are so friendly and always happy to discuss any issues you have at all. It makes such a difference when you have a problem to be able to resolve it quickly and efficiently and Geek Gear pride themselves to be a brand who listens to their customers. 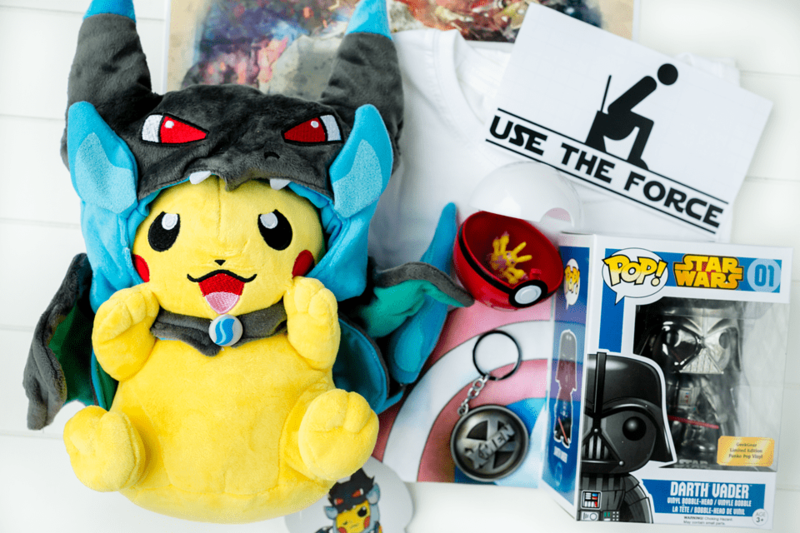 With such a jam packed May box I have to applaud the Geek Gear folk for such a brilliant month and if you think the Battle box was great just wait until you see what they have in store for June’s box – spoiler alert it’s Game Over themed! 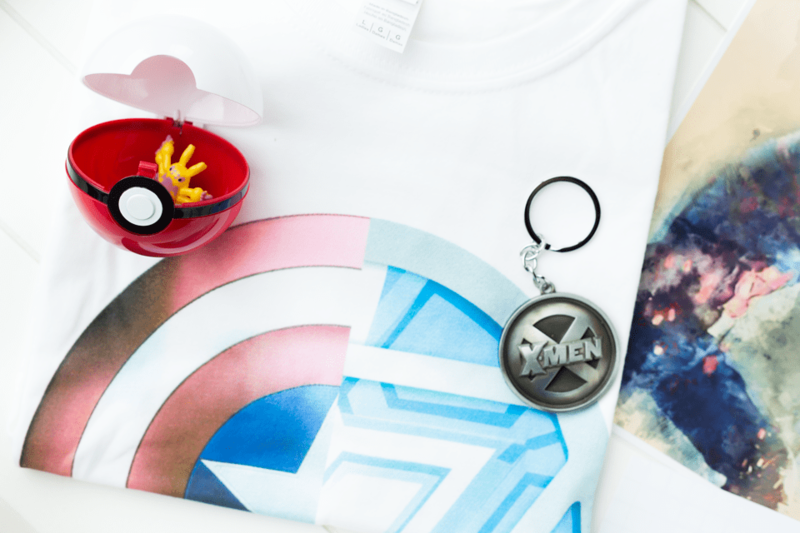 If you would like to try out the Geek Gear subscription box I have a very special offer from the Geek gear team to give you 10% off – and not just off your first box either, that’s 10% off every month’s subscription you sign up for. All you need to do is apply the code below when you checkout online and the 10% will come off your entire subscription. 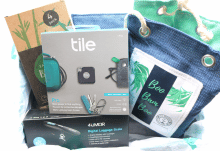 A subscription geek box packed with 5-10 products worth up to £60 each month. How would you rate GeekGear ?